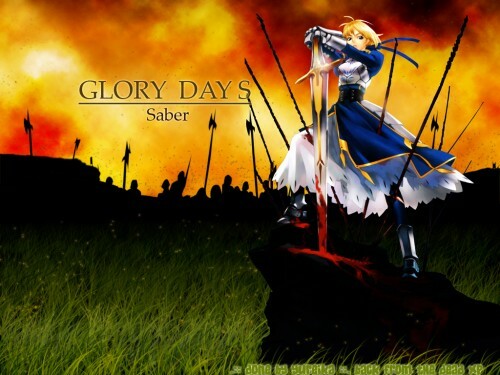 anyways about the wall.. i choose SABER ! cuz she is a kickass servant ...*oh my i just use that word :X* i love her when shes battling although i dont understand her character fully but who cares right ! creadit to nishiki1 for this great scan of saber ! u rock ! I like wat U did to the sky, like they have sparks of ashes flying.. Remember to state your themes! yeah cool sky and I like the whole idea for this wall. and I also love this scan. :) Well really nice work! cool wall =) I love how the blood is dripping down the sword, and all the soldiers in the background. Awesome job yureika-san! Very dramatic feel and effect. Very nice wall! I like the way the character is placed, it gives it a heroic mood in a way or maybe a more "battle of hell" look i'm not sure but i like it! I love the background and the whole concept of the wallpaper. The grass is awsome and it doesn't look fake great work.! aaaaaaaah! es como sacada de una pelicula de drama, donde esta el rey en su momento de gloria al final de la batalla. Muy buen wall, ya es de mis favoritos, excelente trabajo!